Prices above are for melt value based of yesterdays spot gold or silver price. The Gold Eagles listed are not the $1 Gold American Eagle 1oz coins. Also use our Is My Coin Silver tool to see if your coin is silver. Where Can I Get Rolls Of Coins? Banks will provide you with filled rolls of coins in all denominations that are currently in circulation. And you can easily obtain your own empty coin rolls to make organizing your coins a bit easier. So the best place to get them is at any local bank. Your local bank will even give these to you for free. They may have a limit on how many they can give you, however, so you may need to visit multiple banks. Additionally, some coin rolls may be somewhat difficult to find. Dollar and half-dollar rolls may not be available immediately upon asking for them. If that’s the case, you can call around to different banks in your area to see if there are any available, or wait until they have some in stock. For empty paper coin rolls for coins not currently in circulation, or for large bundles of empty coin rolls, you may need to opt for an online retailer to find the coin rolls you want. You can find a large selection from some of the larger retailers, like Amazon and eBay. 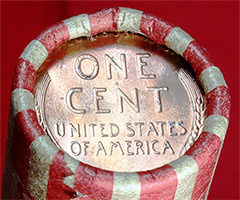 There are also coin niche sites that sell both filled and empty coin rolls to eager collectors. Why Use a Coin Roll? You can certainly dump your load of unwanted coins into massive jars, but this won’t help you organize them very well. The rolls are designed to tightly pack the coins into the wrapper for storage and transportation. Using rolls will help you get a better idea of just how many coins you actually have in your possession. Obtaining filled coin rolls can also be an a bit of an adventure for coin collectors. Coins in circulation will get repacked into coin rolls and given out by banks. You can obtain these filled coin rolls from the bank and open them up to do a little treasure hunting of your own. Is There a Way To Pack Coin Rolls Faster? 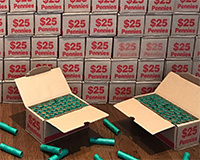 If you’re doing the work by hand, packing coin rolls can be very time-consuming. However, technology wins the day on this end. There are a number of low-tech and high-tech solutions to both count coins and load them into your coin rolls much faster. This includes plastic coin counters that allow you to easily count and load your coins into the wrappers, or machine coin counters that will automatically sort your coins and put them into the appropriate wrappers.